Discussion in 'Dynasty' started by Snarky's Ghost, Sep 28, 2018. And yet they use the Wagnerian wedding march when Krystle and Blake remarry in Season 4...! And they really should have filmed it on one of their fake brick terraces rather than the old living room. And Fallon REALLY needed a new outfit. People like to bag on Kirby for her maternity wear, but I think Fallon got a worse wardrobe. I don't think by then anyone on the show remembered season 1. Or what a wedding coordinator is. Or what au courant meant. After all it was French, so they thought the same as they used to say in the South regarding foreign languages, "if English was good enough for Jesus, it's good enough for me." The first wedding was intended to impress Denver society; the second not so much. Wagner is what most people think of when they imagine a bride walking down the aisle; maybe Krystle's taste is conventional? I don't think the original brick terrace set survived when they reconfigured the mansion set at the start of season three (the guest bedroom set used for Claudia and Sammy Jo also disappeared at the same time). The facade constructed later in the series (was it season 8 or 9? I know it appeared several times in season 9) was horrendous. I wish they had filmed on location at Filoi once or twice each season, if they plotted the season carefully (I know, who am I kidding?) they could have filmed each season's ball/wedding on location. There is even a portion of the garden at Filoli named "The Wedding Place". Or at least film at Filoli for a few days in 1986 when Alexis took over the house. No Fallon's wardrobe was fine. It was very her. Kirby looked like she was wearing maternity smocks from the first day she showed up and started talking to a turtle in the garden. Her fashion was the WORST. Maybe even above Leslie's? 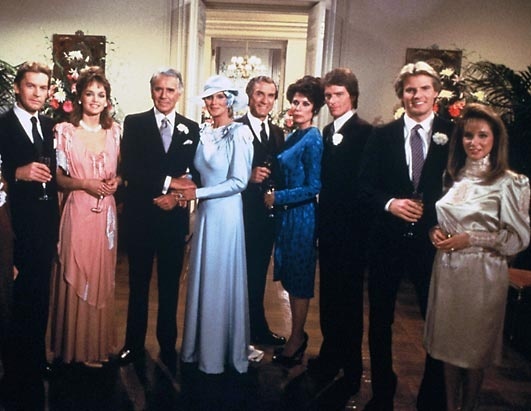 The Wagner/Mendelssohn wedding march is still too bourgeois by DYNASTY's supposed standards. They missed a great opportunity to use some beautiful piece (like Debussy's "Maid with Flaxen Hair"??) to offset the disappointing restraints on B&K's second wedding. Yes, the brick terrace set was gone after S2, but they still had that outer wall of the living room beside the portico entrance way --- that might've been a nice "exterior" place to shoot inside the studio.